Long time no Vaps. I haven’t talked about Vapiano’s for over a year but if you want to cast your mind back to when I did look here. Alright, I absolutely love Vapiano and I don’t think that’s ever going to change. It has a place in my heart and holds so many memories for me. Bankside will always be my number on Vapiano. After heading down there on a Saturday night I noticed a few small changes. The menus had shrunk from large two sided things to being more foldable and compact which works so much better when you have fairly limited room sometimes and just want to focus on one specific part of the menu. But also a member of staff was carrying around a device and able to take drink orders and bring them to the table. Making it feel so much less shifty and awkward than having to go to the bar if you want alcohol or sending a staff member off to find what you want when you order your pizza or pasta. Such a great improvement and made it so much easier. Especially if you order pasta because carrying that and a drink back can be quite a challenge. 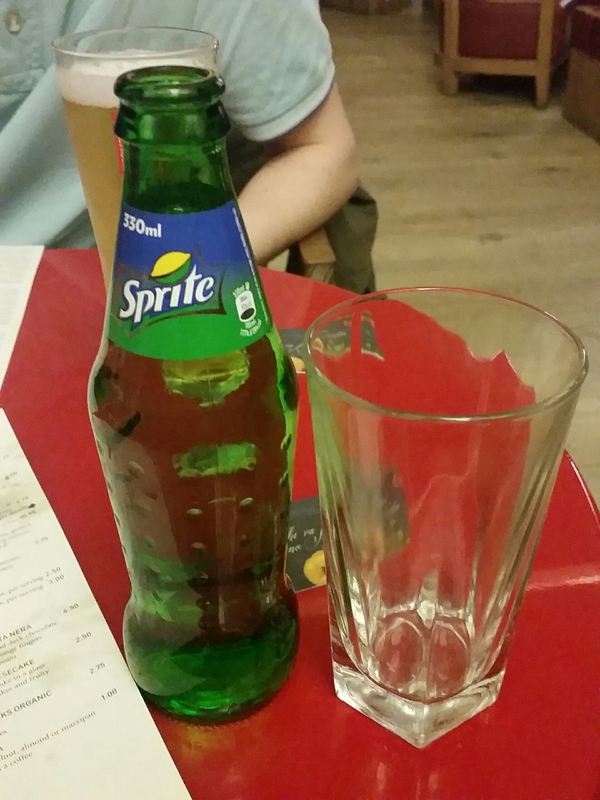 I love that the Sprite came in a glass bottle. I was disappointed that the bottle wasn’t chilled but that would have been forgiven if the glass clearly hadn’t just finished being washed. Nobody wants a semi-warm Sprite and a warm glass and I said no ice because it was a cold night and didn’t think it’d be required. The pizza was incredible and one I hadn’t tried before. The Perla has a ball of mozerella in the middle to act as the pearl or oyster in the opening shell. It is surrounded by a thin ham (I aren’t even going to try and spell it) with tomatoes and fresh greens. It was so fresh and tasty that it really felt hearty and wholesome without being too heavy and filling. I debated as to whether to cut the mozerella ball up and divide it through the pizza or have a great cheesy end to the pizza; I went for the latter. Pure heaven. 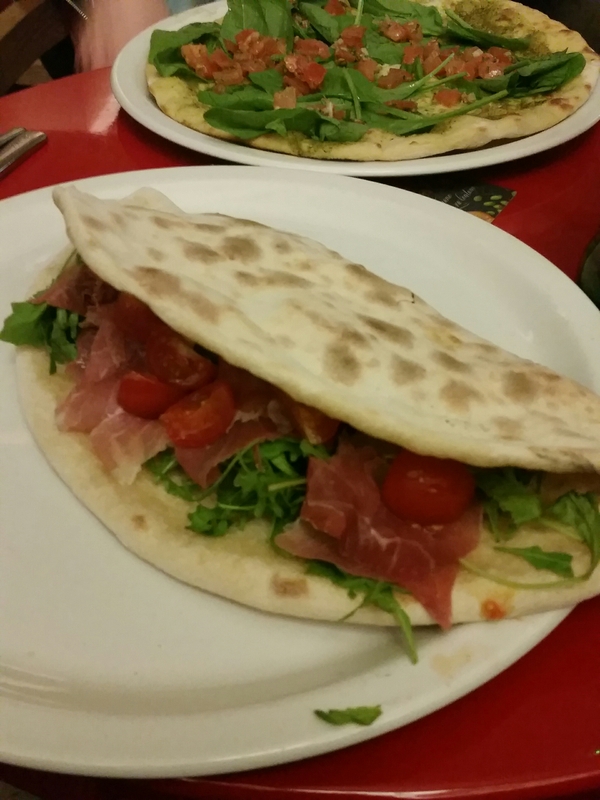 I absolutely love Vapiano and cannot wait to find an excuse to return again and try something different in the future. They’ve also recently opened one up in Manchester so you can get a bit of goodness in you in another location. This entry was posted in Food and Drink, Restaurant Reviews and tagged alcohol, Bankside, bar, Cheese, Food and Drink, fresh, friendly, greens, ham, lblogger, lbloggers, Lifestyle, lifestyle blogger, lifestyle bloggers, London, love, manchester, nice, pasta, perla, pizza, restaurant, Restaurant review, salad, soft drinks, sprite, tasty, uk, vapiano. Bookmark the permalink.